I was lucky enough to be part of the first ever creative technology show at Shaastra 2013, technical festival of IIT Madras. A large team was involved in many technology based creative projects like projection mapping shows and my favorite contribution – virtual instruments ensemble. Virtual Drums were created using gloves with flex sensor (strain based resistance) and shoes with simple TSOP sensors to detect drumming gestures. Virtual piano was made using proximity sensors, a virtual harp with lasers and a virtual guitar using metallic contacts on a hand held strumming pad and a fretting pad with push buttons. The distance between the two pads was measured using an ultra sound sensor. 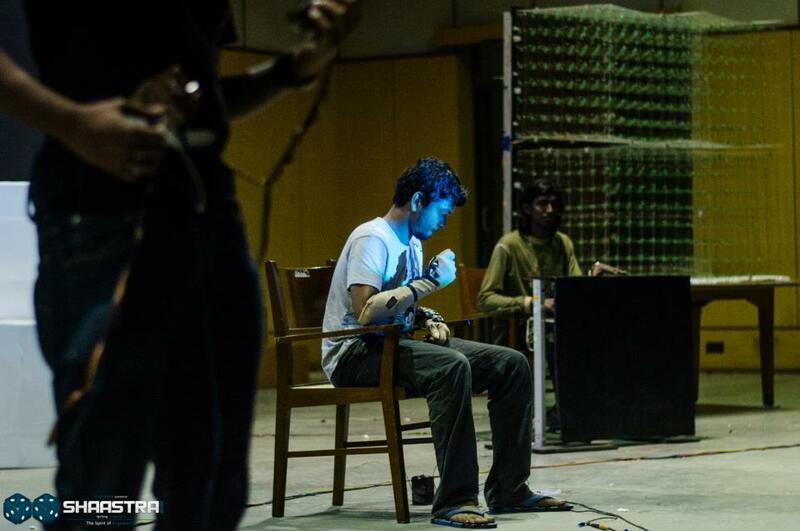 This resulted in a virtual musical instrument ensemble that has been carried forward with each annual edition of the technological festival at IIT Madras. Here is a link of my virtual drums showcase in 2013.